Homemade crackers - they have been on my must make list for over a year! To tell you the truth, for reasons unknown, making my own crackers intimidated me. Well not anymore; they actually are super easy to make and so much tastier than your typical store bought version, not to mention a heck of a lot cheaper. One of my favorite snacks - crackers & hummus. I found myself day dreaming about these crackers during the day, calling Justin panicking 'cause I thought he would eat the last of the crackers before I got home. Luckily he knows me all too well and made sure to save the last of the crackers for my afternoon snack. 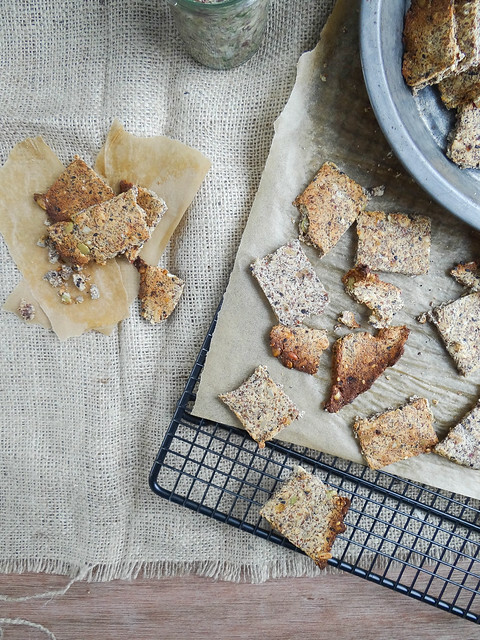 I love a mix of sweet and salty- these crackers were definitely on the sweeter side thanks to the dates and coconut flour - feel free to try chickpea flour for a little less sweet cracker. Or leave out the dates and replace with an additional 1/4 cup or so of water. 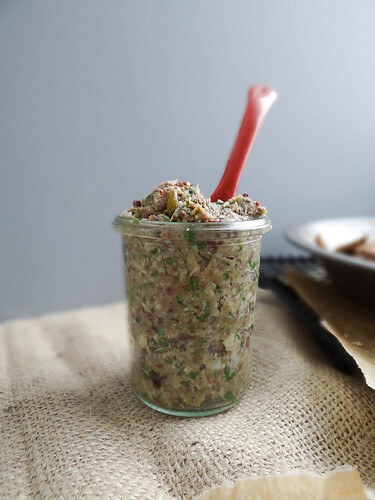 Over the weekend I also made this amazing tapenade from Keepin' it Kind - let me tell you; make these crackers and Kristy's tapenade, you will not be disappointed. 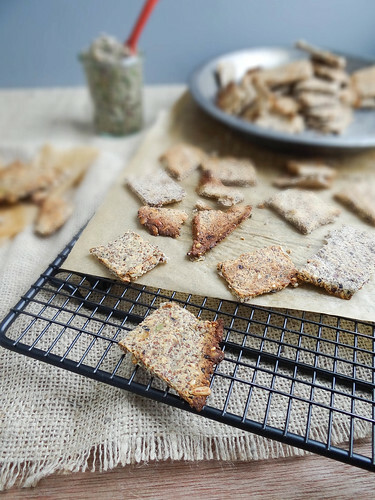 Have you ever made crackers at home before - if so leave the link (if you have one!) in the comments so I can check it out. What is your go to afternoon snack? in a food processor combine dates, 3/4 cup of water & coconut oil and blend until smooth - add the wet mix to the dry and stir well. between 2 pieces of parchment paper roll the "dough" to the thinness of your liking. I rolled mine out to about a 1/4" thickness, next time I would make them a little thinner. Remove the top piece of the parchment paper. With a sharp knife score the top of the dough in a criss cross patter - the width of each cracker is up to you, mine were about a 1" x 1/2" rectangle/diamond. transfer parchment with the crackers directly onto a baking sheet, bake in a pre heated oven for 30-45 minutes turning crackers at the half way mark. The crackers should be golden brown on both sides. Remove crackers from oven and allow to fully cool; the crackers crisp up nicely once cooled. Crackers will keep up to a week. I love the addition of dates in these crackers to make them slightly sweeter! Making crackers has been on my list of things I want my husband to make. He always says he is going to give it a go, and has a stack of recipes I have emailed him, but never makes them. I'll be sure to add this one to the stack and see what happens! these crackers look PERFECT! so crunchy with tons of stuff going on in there. gotta make me some of these. 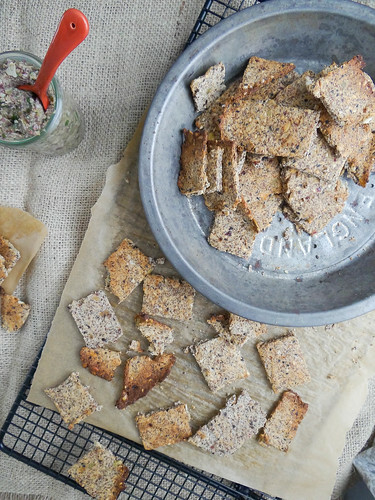 Crackers have been on my must-make list, as well :) Looks like I need to try this recipe and make homemade hummus. ULTIMATE SNACK! Love the variety of seeds. These crackers look delish! I've made Cara from Fork & Beans "cheez-its" and they were so good- and surprisingly easy to make too. Wow those crackers look so yummy! Love the sunflower seed in there. Those crackers look like the ultimate snack! Yum! I love homemade crackers. These look fantastic! I need to try that tapenade too! Awesome Heather! 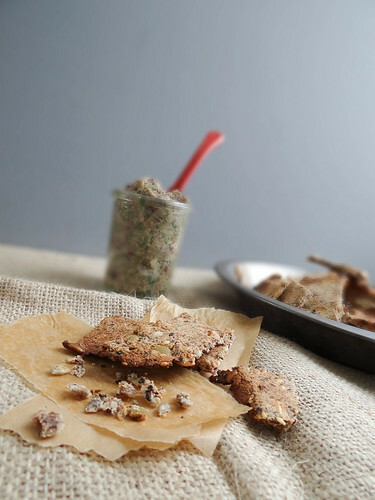 I need to try my hand at homemade crackers - these look fabulous! My all time favorite afternoon/early eve snack is crackers and cheese - hands down! I'll keep you posted! 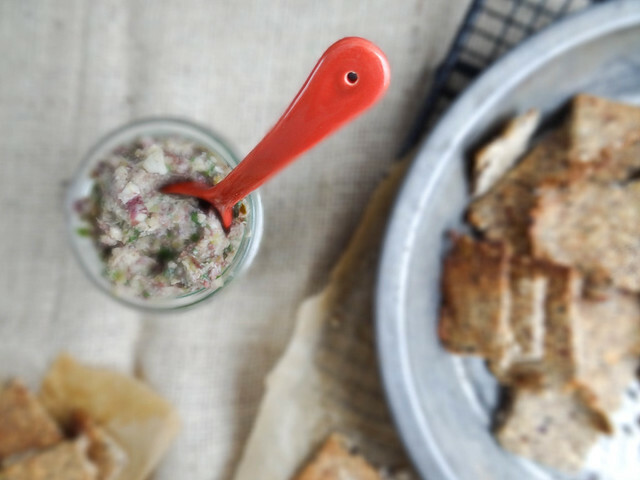 Those crackers look perfect for that tapenade. 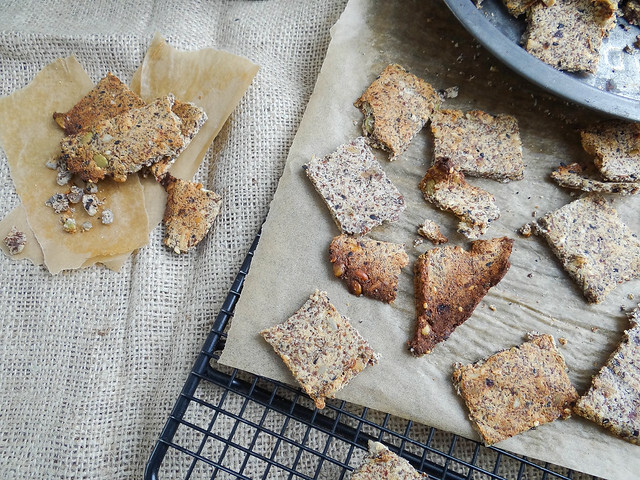 I love crackers with seeds and lots of crunch! my oh my those look incredible!! i could definitely get cozy with a movie and a bowl full of those!! Looks delish - absolutely worth to try! Love the idea of sweeter crackers! The combo of those with the tapenade sounds divine :) I'm feeling inspired! So glad you finally made your own crackers! 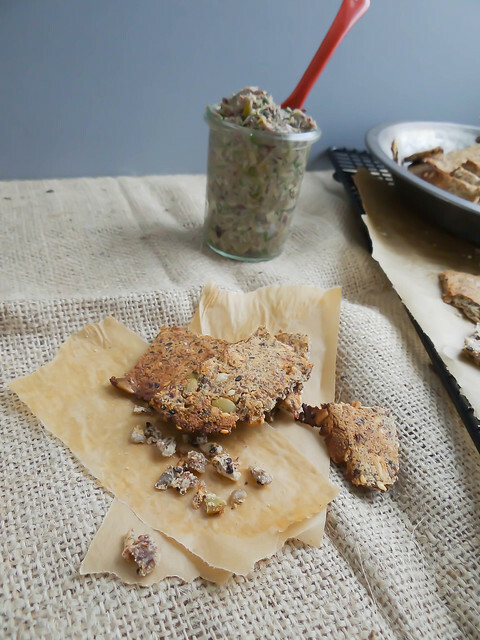 I love a good cracker that tastes good as a snack on its own and also holds up well as a base or dipper for toppings! The tapenade would be perfect with these! 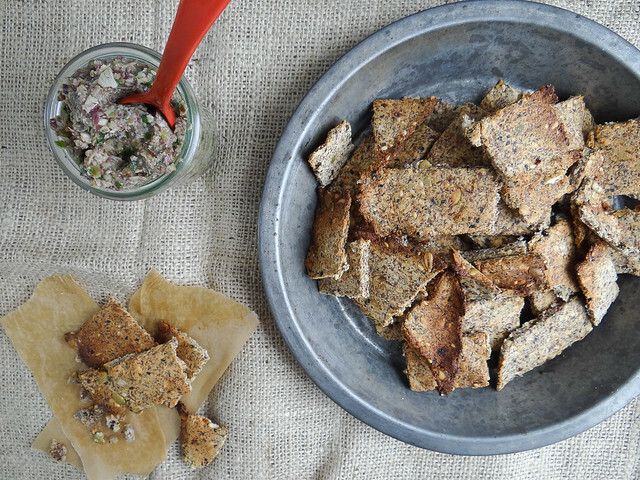 Thanks for sharing your recipe, the crackers look delish! I just tried making them and the dough was pretty wet, not to say a bit soupy is that how it's suppose to be? I followed your recipe and added 1 cup of warm water + 3/4 water but that seems to be too much. What kind of consistency should the dough be? First batch is in the oven, so I hope they turn out ok! Thank you for this amazing recipe! I have made these crackers many times and they always come out wonderful 😊. The only change I make is that I leave out the dates. Everyone who has tasted these crackers loves them! I still amaze myself that I can make crackers that are so good for our bodies and taste so yummy 😊. These crackers are also perfect for my sister who is gluten free 😊. I must say this is Beautiful post and beautiful recipe. I am always looking for new ways to learn healthy recipes. i love very much your multi-seeded-crackers recipe! your this recipe is absolutely stunning. i wish to make this recipe myself. thanks dear to share recipes ideas.